I beefed up the article Wind power with a bunch of information about the mathematics involved. 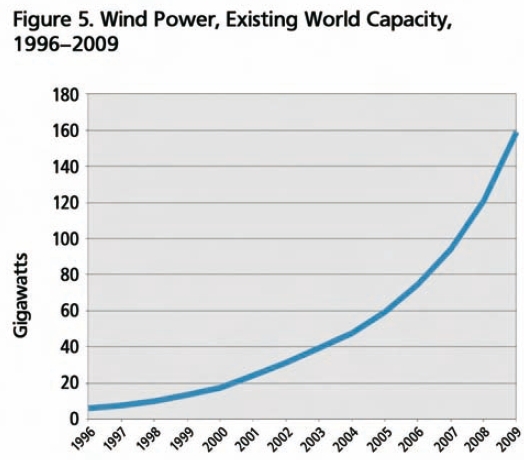 I added a bunch of information about the growth of wind power, including a nice graph. Wind power capacity reached 159 gigawatts in 2009. 38 gigawatts were installed in 2009 alone, a 41% increase over 2008. Over the five-year period from the end of 2004 to 2009, annual growth rates for cumulative wind power capacity averaged 27 percent! I should probably point out that "capacity" is not always met in wind power. There's not always wind! Comment Source:I added a bunch of information about the growth of [[wind power]], including a nice graph. Wind power capacity reached 159 gigawatts in 2009. 38 gigawatts were installed in 2009 alone, a 41% increase over 2008. Over the five-year period from the end of 2004 to 2009, annual growth rates for cumulative wind power capacity averaged 27 percent! I should probably point out that "capacity" is not always met in wind power. There's not always wind! I added a picture, a map of available wind power in UK offshore waters. There's a lot of power if you go far enough out! Comment Source:I added a picture, a map of available wind power in UK offshore waters. There's a lot of power if you go far enough out! Graham, did you see Mckay ch.4 in UK can generate (in MacKay Std units) 20 Kwh/day and ch6. shallow offshore wind gives 16 kWh/day and deep 32 kWh/day. So it is more but only for deep expensive offshore or "prohibitively expensive" (p.64). That is the biggest hurdle to adoption. Comment Source:Graham, did you see [Mckay ch.4](http://www.azimuthproject.org/azimuth/show/David+MacKay) in UK can generate (in MacKay Std units) 20 Kwh/day and ch6. shallow offshore wind gives 16 kWh/day and deep 32 kWh/day. So it is more but only for deep expensive offshore or "prohibitively expensive" (p.64). That is the biggest hurdle to adoption. This is from the wind farm page. Statoil are finding out if it is prohibitively expensive or not. Comment Source:This is from the [[wind farm]] page. [Statoil are finding out](http://www.statoil.com/en/TechnologyInnovation/NewEnergy/RenewablePowerProduction/Offshore/Hywind/Pages/HywindPuttingWindPowerToTheTest.aspx) if it is prohibitively expensive or not. ### Deep offshore demo in Norway ### Ten kilometers off the south-west coast of Norway, Statoil’s Hywind is the world’s first full-scale floating wind turbine. Statoil will test the wind turbine over a two-year period. According to [Statoil](http://www.statoil.com/en/TechnologyInnovation/NewEnergy/RenewablePowerProduction/Offshore/Hywind/Pages/HywindPuttingWindPowerToTheTest.aspx) > The primary intention is not to derive revenues from the power generated by Hywind, but to test how wind and waves affect the structure. Once these answers have been obtained, Statoil can work on commercialising the concept. The goal is to reduce costs so that floating wind power can compete in the energy market. i added a subsection in math on limitations - betz limit. Comment Source:i added a subsection in math on limitations - betz limit. I added some comments of MacKay. Comment Source:I added some comments of MacKay. I think we should roll the capacity factor of wind power into wind power, since there is already data on grid integration using similar sources, and that the critique of the Archer and Jacobson paper needs some more information for perspective IMO, but I'd like to run it by y'all just to make sure it seems reasonable before adding it. In terms of reliability, a large generator does have the advantage of scheduling maintenance weeks or months in advance, but it also has the disadvantage of instantaneously losing some or all of its output with no warning at all if there is equipment failure. A single wind turbine can do the same thing, but this is virtually impossible with a wind farm as a whole. In that context a large generator is more reliable in terms of planned outages, and more unreliable in terms of unscheduled outages. With short term weather forecasting we usually have a better idea as to when and how much wind power can vary as opposed to forecasting unexpected equipment failures, but we can't schedule downtime like we can with a large generator. The statement that wind power already has the best sites available for baseload also seems far-reaching. While it's likely true that wind farms are situated in a way that allows them to compete most effectively with existing generation, that isn't the same as saying they are situated in a way that allows them to compete most effectively with existing baseload generation. Many wind farms compete with local load following or peaking generators because as a relatively new source of electricity and have had relatively high costs compared to generators that already have sunk infrastructure costs and can profit based only on their O&M costs. They probably don't have the best capacity factor in terms of baseload wind power in general, just compared to the generators they are competing with locally, that may or may not be baseload. It's also kind of weird to talk about demand in the general sense as reaching a maximum in summer and minimum in winter. That depends on what grid we're looking at (ercot, wecc, etc), and even what part of a grid we're looking at. For instance in the wecc, there's a bi-directional HVDC line running from Washington to California because when people in California are demanding the most power in the summer, people in Washington aren't, and vice versa in the winter. Comment Source:I think we should roll the [[Capacity factor of wind power|capacity factor of wind power]] into wind power, since there is already data on grid integration using similar sources, and that the critique of the Archer and Jacobson paper needs some more information for perspective IMO, but I'd like to run it by y'all just to make sure it seems reasonable before adding it. In terms of reliability, a large generator does have the advantage of scheduling maintenance weeks or months in advance, but it also has the disadvantage of instantaneously losing some or all of its output with no warning at all if there is equipment failure. A single wind turbine can do the same thing, but this is virtually impossible with a wind farm as a whole. In that context a large generator is more reliable in terms of planned outages, and more unreliable in terms of unscheduled outages. With short term weather forecasting we usually have a better idea as to when and how much wind power can vary as opposed to forecasting unexpected equipment failures, but we can't schedule downtime like we can with a large generator. The statement that wind power already has the best sites available for baseload also seems far-reaching. While it's likely true that wind farms are situated in a way that allows them to compete most effectively with existing generation, that isn't the same as saying they are situated in a way that allows them to compete most effectively with existing baseload generation. Many wind farms compete with local load following or peaking generators because as a relatively new source of electricity and have had relatively high costs compared to generators that already have sunk infrastructure costs and can profit based only on their O&M costs. They probably don't have the best capacity factor in terms of baseload wind power in general, just compared to the generators they are competing with locally, that may or may not be baseload. It's also kind of weird to talk about demand in the general sense as reaching a maximum in summer and minimum in winter. That depends on what grid we're looking at (ercot, wecc, etc), and even what part of a grid we're looking at. For instance in the wecc, there's a bi-directional HVDC line running from Washington to California because when people in California are demanding the most power in the summer, people in Washington aren't, and vice versa in the winter. It's also kind of weird to talk about demand in the general sense as reaching a maximum in summer and minimum in winter. The Archer and Jacobson paper relates to the midwestern United States. I've added a comment to that effect, and the abstract of their paper. While your other statements make sense to me, they need to be backed up with references. If that's too much work you could phrase your concerns with Bill Hannahan's comments as questions. Comment Source:> the critique of the Archer and Jacobson paper needs some more information for perspective I agree. > It's also kind of weird to talk about demand in the general sense as reaching a maximum in summer and minimum in winter. The Archer and Jacobson paper relates to the midwestern United States. I've added a comment to that effect, and the abstract of their paper. While your other statements make sense to me, they need to be backed up with references. If that's too much work you could phrase your concerns with Bill Hannahan's comments as questions. I added the questions and will hopefully update them as I collect some good sources, and I've also added some more info to "wind power and the electrical grid" about negative pricing and alternative uses for overproduction by wind farms. Comment Source:I added the questions and will hopefully update them as I collect some good sources, and I've also added some more info to "wind power and the electrical grid" about negative pricing and alternative uses for overproduction by wind farms. I added a link to some Dutch statistics for the Netherlands. Today was in the news (side news) that the so-called Windex (amount of wind compared to reference period '96-'05, in percent) was only 77, the lowest so far, so this induced some googling to find the source, with the statistics as byproduct. Comment Source:I added a link to some Dutch statistics for the Netherlands. Today was in the news (side news) that the so-called Windex (amount of wind compared to reference period '96-'05, in percent) was only 77, the lowest so far, so this induced some googling to find the source, with the statistics as byproduct. because I think it's not correct, or at least misleading. Comment Source:Incidentally I arrived on [[Wind power]]. I have removed a broken link (which looked like an advertisement) and I also removed the statement > Eddy diffusivity is modeled by Monin-Obukhov similarity theory because I think it's not correct, or at least misleading. Wind power capacity is growing rapidly, as shown in the following chart taken from the Renewables 2010 Global Status Report. Over the five-year period from the end of 2004 to 2009, annual growth rates for cumulative wind power capacity averaged 27%. However, the percentage increase has been dropping since then. From 2009 to 2010 wind power capacity grew 25%, from 159 gigawatts to 198. From 2009 to 2011 it grew 20%, to 238 gigawatts.